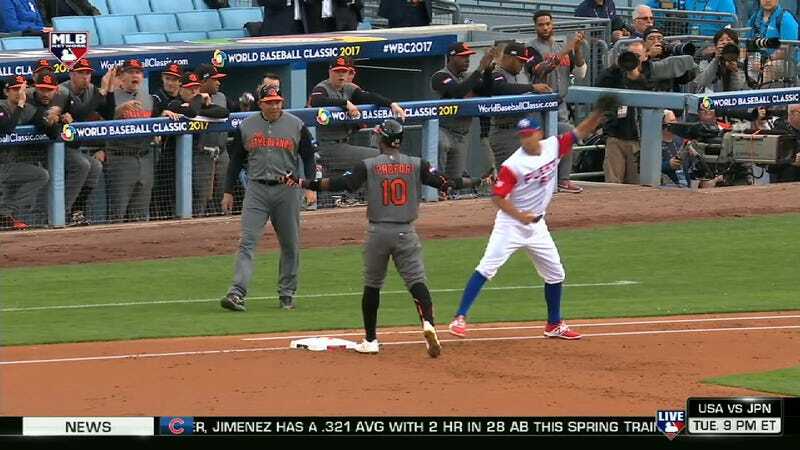 In the World Baseball Classic semifinal between Puerto Rico and the Netherlands, Dutchman Jurickson Profar got ahead of himself while celebrating a first-inning single to right field. Puerto Rico’s right fielder threw a rocket to catcher Yadier Molina to hold up the runner at third, and then, as Profar was nonchalantly strolling back to the base and waving his arms at his dugout, Molina capitalized on the moment and threw him out at first. Lesson: Don’t gloat about a meaningless single. And definitely not before you’re on the bag.